AS IT STANDS: Why Bother Having An Election That's Rigged? Next year's House races are over before they even start. Thanks to extreme redistricting by the GOP, the 2018 House elections are pre-determined. 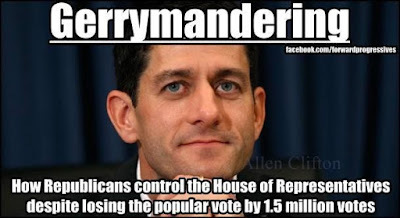 Republicans will win via segregating voters by party, thanks to their illegal remapping of House districts in 2011. Worse, many voters aren't voting because they know what the outcome will be in their district. Incumbents aren't held to any accountability, because they know their locked in with the system. In essence, Republicans have found another way to subvert democracy. There's 435 seats in the House of Representatives. It takes 218 seats to hold a majority. Even if every Democrat is re-elected, the party is still short 25 members to gain control. A group called FairVote who have a 99.9 percent accuracy rating for correctly picking political races, doesn't give the Democrats a chance in hell. When an election is deemed over, before it takes place, you know something is wrong. The anti-democratic nature of House elections is eroding people's confidence in the system. Why vote when the outcome is pre-determined? 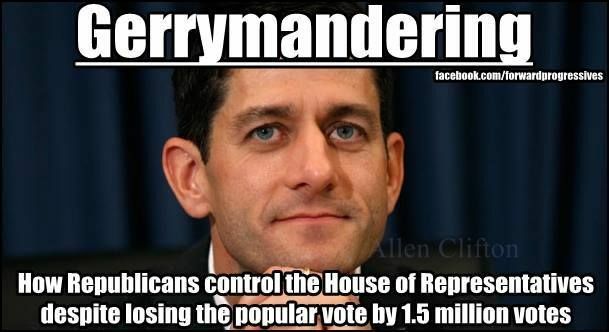 Gerrymandering is the GOP's ace-in-the-hole. The only thing that could possible upset this equation is that if Trump-haters turn out in record numbers for the elections. Right now, the GOP is confident that they have a stranglehold on the 2018 elections. And they probably do.